Being an MC at Refuge is an important role, and we made this tutorial so we can guide you every step of the way! We would like you to be at Refuge at 9:15am so you can be a part of our Team Rally. We will then go over service order at 9:45am in the Green Room. Another reason why we would like you to be here a little early is so Pastor Matt can go over what you prepared for offering, just so we can be on the same page. You'll be able to look on planning center once you have been scheduled to see a detailed list of everything going on. When you MC, you will be given a small page of notes that you can reference with all the information you need to know to communicate to the people for that specific service! This will be given to you that morning. Since you're the MC, that means you're the speaker that's making the first impression on visitors and members alike. So to be calm, happy, and collected is key. Make sure you go over all your notes, so you're not caught saying "um" or "uhhh". If you do a few times it's no big deal but when you are confident in what you are saying it helps visitors understand better. At Refuge we want people to feel invited, comfortable, and accepted so we would like to to dress casually. There is no need to wear a suit and tie or an elegant dress, wear what makes you feel like you, in all modesty of course. Below are a few examples of what you could wear. Greeting everyone is pretty easy and should only take you a minute. Here are a few things you should say. Welcome to Refuge, we’re so glad you’re here! Connect Card is located in the seat pocket in front of you. If this is your first time at Refuge, fill it out and take it to the Welcome Center after service where we have a free gift for you. See! That's so easy! The greeting should only take 1 minute. You should also introduce yourself, if you volunteer at Refuge you can say something like "Good morning everyone, my name is Jonny Appleseed and I'm a part of the Welcome Team here at Refuge." Remember, it's always good to be fun and energetic. Have a smile on your face and if you have your notes with you, try not to look at them to often. A great transition into offering is "Now we are going to continue our worship with giving." Here is a few things you should say during offering. Guests, if this is your first time don’t feel obligated. There are four different ways you can give: in-person, text to give, Refuge Official App, and online at wearerefuge.net/give. Again, super easy! Offering will last for 2 minutes. An easy way to fill the time is with a verse or short testimony/story that is applicable. There are tons of verses on giving, take some time with God and pray about it or even ask Pastor Matt for some help, he will be happy to send you a verse. Once your finished you will pray over the offering. After you pray over offering, you can invite the hosts to receive the offering and then introduce church news. See, thats not so bad! Always feel free to ask for help from any of our pastors or leaders. Finally we have dismissal. This is the part of service where we wrap everything up. Here are a few things you should say. Guests fill out Connect Card and turn in at Welcome Center for free gift. Prayer is available at the front if you need someone to believe with you or if you decided to follow Jesus today. Remind congregation of any upcoming events. This shouldn't take any longer then 2 minutes. An easy transition from the closing song to dismissal is to share something that you took away from the message. A 30 second statement would be perfect. After that is when you would share the two items above. You'll then talk about how excited you are about the events coming up, you'll briefly share about one or two events coming up. It's important to be happy and energetic after you share what you took away from the message. It may be difficult but we want the church to feel happy and light hearted when they leave. A good way to show your enthusiasm is to simply smile. Just a smile on your face can do the trick. These are a few different service orders from Planning Center. 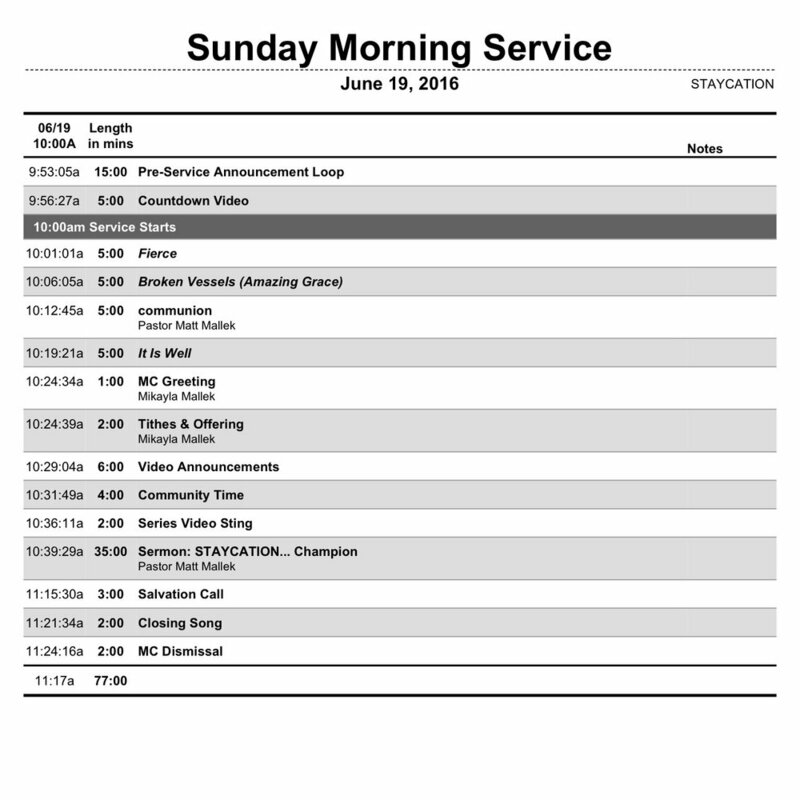 Each week stays generally the same, depending on what is going on, but you will be able to see the order of service in Planning Center once it is ready, so you will have ample time to prepare. Going over your notes and reading this whole page can help you a lot, but it might not help once you get on stage and see a crowd of people waiting to hear what you have to say. But to see people in action can help immensely. Here are a few examples of what some other churches do. Now these are by no way perfect, and every time will be different, but these are just a few examples that you can go by as far as what to say or how to act. Now that was great, she said a few "ums" and "uhh" but thats okay, we aren't expecting you to be perfect. But could you feel her energy? She was confident and how she connected to the church, thats what we want to do. Now the offering message is a bit different because they were giving to a cause, but she still told a story. She didn't go to much into it either, she gave detaills and enough infomation so the church could feel comfortable giving. As you can see in this offering message is that he used a Bible verse and a story. He also got personal. Getting personal and sharing a story from your own life can be helpful in getting people to connect not only with the church, but with you as well. And thats what we want, at Refuge we want people to feel as welcomed and as comfortable as God makes them feel. Now that you've read this whole page and watched all the videos, you must be a pro now. Right? Well maybe not. If there is anything you still have questions on or if you would like a few more pointers please talk to us. It's better to ask as soon as possible rather then right before you're suppose to go on stage. We want you to succeed. The last thing we want is for you to not be prepared. If you like we could even get you in contact with someone who has been MC before, or set up a meeting with one of our leaders and they could give you more advice. Thank you so much for taking the time to read this page and become a better MC. At Refuge we believe all people matter to God, this is a place where people can grow while finding authentic hope, purpose, and love through Jesus. We believe that applies to you as well, not just our visitors.